Enterprise Architect is an open platform that supports any requirements engineering process. The tool has a rich feature set and is highly configurable, and its flexible design means that whatever method is being used, the modeler will find features to help. 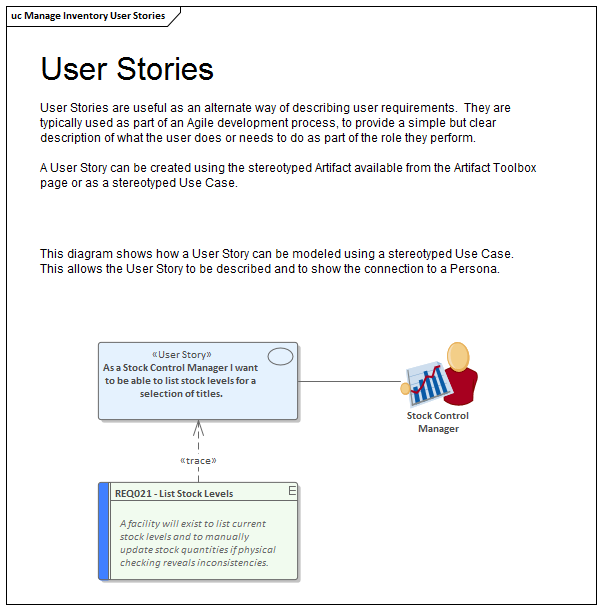 So whether the team is using formal Requirements, Use Cases, User Stories or Story-Boards in any combination, Enterprise Architect can be used to develop, manage and document the requirements. The implementation of the UML extension mechanisms means that any type of requirement can be created and managed using built-in types or by using Stereotyped elements and Tagged Values.